A team led by Andrea Ghez, professor of physics and astronomy in the UCLA College, determined that G2 is most likely a pair of binary stars that had been orbiting the black hole in tandem and merged together into an extremely large star, cloaked in gas and dust—its movements choreographed by the black hole's powerful gravitational field. The research is published today in the journal Astrophysical Journal Letters. "G2 survived and continued happily on its orbit; a simple gas cloud would not have done that," said Ghez, who holds the Lauren B. Leichtman and Arthur E. Levine Chair in Astrophysics. "G2 was basically unaffected by the black hole. There were no fireworks." Black holes, which form out of the collapse of matter, have such high density that nothing can escape their gravitational pull—not even light. They cannot be seen directly, but their influence on nearby stars is visible and provides a signature, said Ghez, a 2008 MacArthur Fellow. Ghez, who studies thousands of stars in the neighborhood of the supermassive black hole, said G2 appears to be just one of an emerging class of stars near the black hole that are created because the black hole's powerful gravity drives binary stars to merge into one. She also noted that, in our galaxy, massive stars primarily come in pairs. She says the star suffered an abrasion to its outer layer but otherwise will be fine. Ghez and her colleagues—who include lead author Gunther Witzel, a UCLA postdoctoral scholar, and Mark Morris and Eric Becklin, both UCLA professors of physics and astronomy—conducted the research at Hawaii's W.M. Keck Observatory, which houses the world's two largest optical and infrared telescopes. When two stars near the black hole merge into one, the star expands for more than 1 million years before it settles back down, said Ghez, who directs the UCLA Galactic Center Group. "This may be happening more than we thought. The stars at the center of the galaxy are massive and mostly binaries. It's possible that many of the stars we've been watching and not understanding may be the end product of mergers that are calm now." 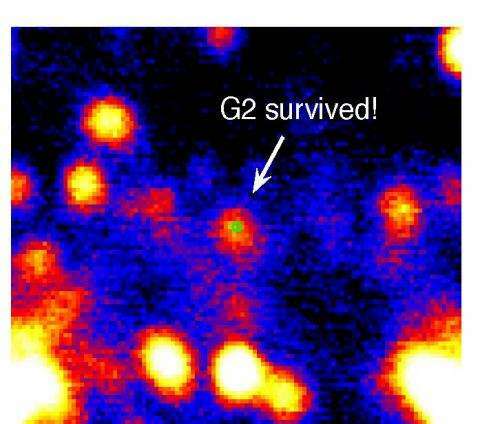 Ghez and her colleagues also determined that G2 appears to be in that inflated stage now. The body has fascinated many astronomers in recent years, particularly during the year leading up to its approach to the black hole. "It was one of the most watched events in astronomy in my career," Ghez said. Ghez said G2 now is undergoing what she calls a "spaghetti-fication"—a common phenomenon near black holes in which large objects become elongated. At the same time, the gas at G2's surface is being heated by stars around it, creating an enormous cloud of gas and dust that has shrouded most of the massive star. Witzel said the researchers wouldn't have been able to arrive at their conclusions without the Keck's advanced technology. 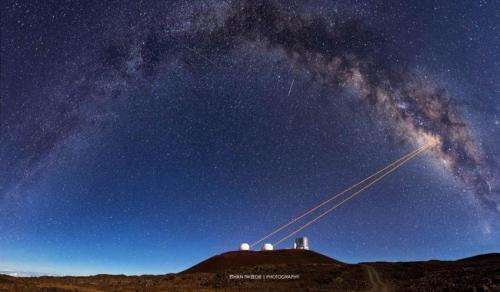 "It is a result that in its precision was possible only with these incredible tools, the Keck Observatory's 10-meter telescopes," Witzel said. The telescopes use adaptive optics, a powerful technology pioneered in part by Ghez that corrects the distorting effects of the Earth's atmosphere in real time to more clearly reveal the space around the supermassive black hole. The technique has helped Ghez and her colleagues elucidate many previously unexplained facets of the environments surrounding supermassive black holes. "We are seeing phenomena about black holes that you can't watch anywhere else in the universe," Ghez added. "We are starting to understand the physics of black holes in a way that has never been possible before." I even doubt they know where the center of the galaxy is. No it doesn't. That page is not testing GR. It is testing a classical lensing equation which is known to be wrong. GR has a much tighter requirement for alignment. That page is shooting at a strawman. The preprint does contain direct observations if you looked. Stephen Hawking himself says he was wrong about black holes. Read the article on the Nature site for proof. The GR has no "much tigher" requirements, as its lensing is twice as large as the lensing predicted with classical physics. The classical model I was referring to was not the Newtonian one but a guy who used the GR value but applied optics to change how it scaled with distance, i.e. the alignment constraint. This is not actually the site I though it was, it's a another guy making similar claims. Apologies for the mistake. This guy's mistake is not using a different model but failing to understand the equation he is wielding. What that equation tells you is the angular deflection of a distant star where the light rays are parallel. Are the light rays from this star parallel at closest approach? No. Because the star is at the closest approach the lensing will not change the observed angular position of the star. "... determined that G2 is most likely ...." This doesn't sound to me that they're really sure what's going on here with G2. The equation he used assumes all deflection happens when the light passes it's closest approach but the emitter is at closest approach. The rays are isotropic here and so any deflection doesn't shift the star image. The true expression for deflection taking this into account will be more complicated. This simple expression simply isn't applicable. I've been thinking of putting an AO corrector in front of my astrocamera for quite a while now. The one that works with my camera is about US$1,700.00. I don't generally get better than 1 arcsecond seeing in my area, though I have dark-sky sites available that regularly get 1/4 arcsecond within an hour's drive. OTOH, it's a huge hassle to pack everything up and drive there, and it would be nice to work in my back yard (I have a SkyShed POD and a Celestron C9.25 on a Losmandy G-11 with the Gemini robotic controller, and a TeleVue NP127is for wide-field shots, with a GPDX and SS2K robotic controller; my imagers are a Sony Alpha a77, a Minolta Maxxum 9, a Nikon F3, and a Starlight Xpress SXV-H9C megapixel astrocamera). "We are seeing phenomena about black holes that you can't watch anywhere else in the universe,"
Right, because astronomers here on Earth know what it's like to look into outer space from other planets, moons, etc. This is probably the most uneducated statement I've ever read when it comes to astronomy. Not only does this person not know if there is intelligent life elsewhere in the universe that's watching the same exact thing, but this person has no clue what it's like to look at events from any other point in the universe. Prof. Hawkins is putting in question the nature of black holes because of the information paradox. Not the existence of such massive objects. Right, because astronomers here on Earth know what it's like to look into outer space from other planets, moons, etc. Errr, "that you can't watch anywhere else in the universe [except around black holes]," not "that you can't watch *from* anywhere else in the universe [for instance from other solar systems]." Snicker. Don't encourage him, Techno.